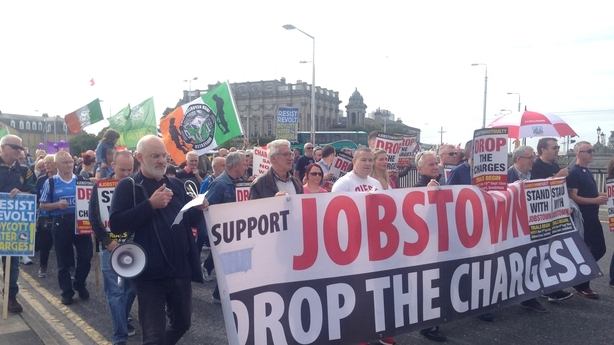 Thousands of protesters gathered in Dublin this afternoon for a national demonstration against water charges. 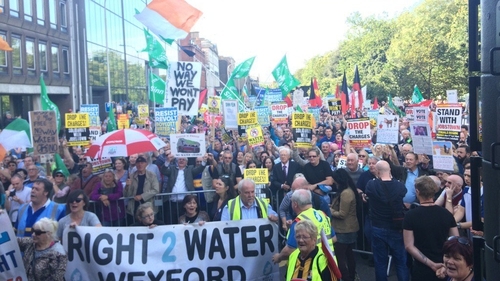 Right2Water said 80,000 took part in today's protest. Other estimates of the crowd in St Stephen's Green put the figure at up to 15,000. Marchers began gathering at Heuston Station and Connolly Station at 2pm before marching to St Stephen's Green to hear speeches. Rolling road closures took place along the routes. The demonstration also included a protest outside the headquarters of Apple because of the Government's planned appeal to the European Commission ruling that Ireland granted the company illegal state aid worth €13bn. Legislation to allow for the suspension of water charges for nine months was passed in June. The suspension of the charges is part of the Fine Gael-Fianna Fáil Government facilitation deal. The deal agreed by both parties in May recommended that Irish Water be retained and an external advisory board be set up on a statutory basis to look at its operations. It proposed suspending the water conservation grant and restoring funding to group water schemes based on pre-2015 levels. However, the Right2Water campaign has said it has no faith in the expert panel set up by Government to examine water charges and that voters who gave TDs a mandate to abolish Irish Water and water charges remain angry that the issue has not been sorted out.